White Gum Apples Pty Ltd, located at Barkers Creek, near Harcourt in Central Victoria, is a 100% Australian owned family business dedicated to providing the best natural fruit juices available anywhere. 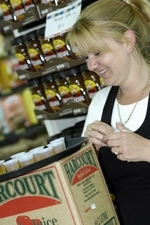 Harcourt Apple juice was first produced in 1992 by Neil and Leanne Norris, to answer the need for a pure, fresh, locally produced apple juice, which retains the natural refreshing taste of real apples. More than a decade later, the traditional cold pressing techniques are still used to produce superior apple and pear juices, without rival anywhere. Simon and Vicki Frost bought the company in June 2002 and the business has grown from strength to strength, building a new production facility alongside The Little Red Apple, their thriving Fruit and Veg. business, and in 2006 completing a major upgrade of juice production equipment. Then in 2016, an even bigger expansion of the manufacturing and warehouse. The improvements in production equipment and efficiency have allowed the business to expand and our products are now available throughout a much larger area. The Little Red Apple, located on the Midland Highway at Barkers Creek (halfway between Castlemaine and Harcourt, Victoria), and has a whole lot more to it than the name suggests. 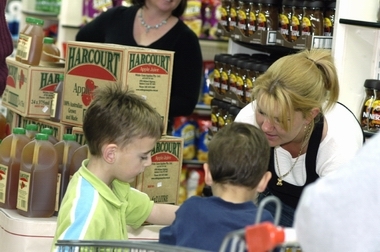 Simon and Vicki have been owner/operators of The Little Red Apple since 1993. 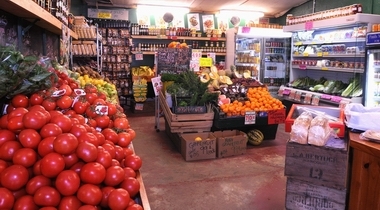 The Little Red Apple specializes in retailing a huge range of premium quality fruit and vegetables and operates 7 days a week. An important aspect of the business for Simon and Vicki is to stock locally grown produce wherever possible. As well as locally grown produce, they also stock a diverse range of locally produced jams, chutneys, honeys, herbs, and of course, apples and pears. When they have time away from their other operations, Simon and Vicki spend time with their other passion, Jaara Farm.